Garje Khamtrul Rinpoche Jamyang Döndrup (Tib. སྒ་རྗེ་ཁམས་སྤྲུལ་རིན་པོ་ཆེ་འཇམ་དབྱངས་དོན་གྲུབ་, Wyl. sga rje khams sprul rin po che 'jam dbyangs don grub) (b. 1927) — the incarnation of the third Khamtrul, Gyurme Trinle Namgyal (1879-1926). A teacher of Dzogchen based in Dharamsala, where he served as the General Secretary of the Council for Cultural and Religious Affairs, before he retired in 1986. 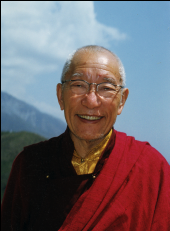 He taught on Tendrel Nyesel in Lerab Ling in 1992, and on Yang Nying Pudri in Dzogchen Beara in 2000. This page was last edited on 6 June 2018, at 06:03.